7 We Will Make Peace Prevail! 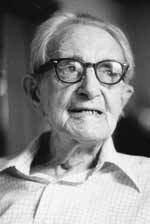 Professor Dirk J. Struik of Massachusetts died in 2000, aged 106. In 1944 Dirk Struik was a national sponsor of American Youth for Democracy. Dirk J. Struik was a sponsor of the Scientific and Cultural Conference for World Peace which ran from March 25 - 27, 1949 in New York City. It was arranged by a Communist Party USA front organization known as the National Council of the Arts, Sciences, and Professions. The conference was a follow-up to a similar gathering, the strongly anti-America, pro-Soviet World Congress of Intellectuals which was held in Poland, August 25 - 28, 1948. In the late 1960s Dirk Struik was listed as a Sponsor of American Committee for Protection of Foreign Born. On April 28, 1966 Dirk Struik was a speaker at the Herbert Aptheker Testimonial Dinner. The dinner was held on the occasion of Herbert Aptheker's 50th birthday, the publication of his 20th book, and the 2nd anniversary of the American Institute for Marxist Studies. It was held in the Sutton Ballroom, The New York Hilton, Avenue of the Americas, 53rd to 54th Street, New York City. Most speakers, organizers and sponsors were known members or supporters of the Communist Party USA. Struik was also a sponsor of the event. Science & Society is a quarterly journal of Marxist thought and analysis. Published without interruption since its inception in 1936. With a press run of about 2,500 copies, the journal reaches 565 individual subscribers, of whom 475 are in the United States and 90 reside in other countries. S&S also has 800 library and other institutional subscribers, both in the United States and abroad. In its early years, Science & Society played a unique role in providing a home for scholarship in the Marxist tradition. It attracted contributors from many countries, and was a major site of interaction among Marxist researchers in capitalist countries and those working in the Soviet Union and Eastern Europe. The British "social relations of science" movement was well represented, including some of that school's leading figures, such as J. B. S. Haldane, Hyman Levy and J. D. Bernal. Also from Britain, political economists such asMaurice Dobb, and historians such as Eric Hobsbawn and Christopher Hill, contributed regularly; in this way, S&S played a role in the early development of the British Marxist Historians school. In the United States, leading figures in history, literature and the social sciences, such as Joyce Adler, Herbert Aptheker, M. F. Ashley Montagu, W. E. B. DuBois, Abraham Edel, Lewis S. Feuer, Philip S. Foner, Margaret George, Alvin W. Gouldner, Irving Louis Horowitz, Corliss Lamont, Eleanor Burke Leacock, Robert S. Lynd, Robert K. Merton, June Nash, Joan Robinson, and William Appleman Williams, among many others, wrote articles and reviews for the journal. Science & Society was founded, after a developmental period of several years that involved two main centers: one group in Boston, led by the MIT mathematician Dirk Struik, and another in New York, with significant participation from faculty members at New York University. Founding editor Margaret Schlauch, the distinguished linguist and medievalist, was a member of the English Department at New York University, as was Edwin Berry Burgum, another S&S founding editor. Dr. Annette T. Rubinstein, who was not a founding editor but joined the Editorial Board in the 1960s and was active with the journal until her death in 2007 at age 97, also taught briefly at NYU, where there was a concentration of S&S activism in the first period of the journal's existence. The signatories which included Dirk Struik urged Congress to act on North Korea's Concerns. Dirk Struik was listed on the Committee of Sponsors. In May 1995 the Communist Party USA newspaper Peoples Weekly World published a May Day supplement. Included was a page offering May Day greetings to Massachusetts Communists Lew Johnson, Laura Ross, and Ann Timpson. Endorsers of the greeting included Dirk Struik. This page was last modified on 27 October 2015, at 22:42.